So there I am in the local supermarket, gathering ingredients meeting the 100 mile rule, and when I saw a bag of “Noix de Grenoble” I thought that by a long stretch of imagination, I could qualify this purchase since it was a product of my home town. 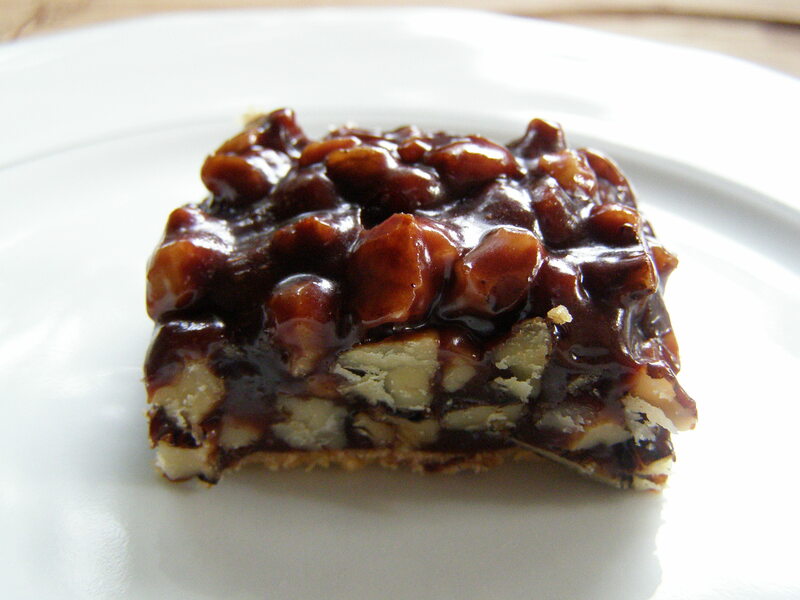 I quickly proceeded to turn those walnuts into yummy squares, by melting together in the microwave 3/4 cup of honey, 50 gr of bitter chocolate, 1/8 cup butter. I added one and a half cup of chopped walnuts and two sprinkles of cinnamon, poured the mix over a pastry dough and baked at 325 for 20 minutes in a square pan. Then, cool down, and cut in squares. Almost a healthy treat! Now, I am putting the stuff away and read the labels on the “Noix de Grenoble” packaging. To my absolute horror, it says “Product of the USA”. So much for my comfort food, I have been cheated and deceived by Uncle Sam, the US now grows “Noix de Grenoble” in California. Yes, this is totally Hollywood style, I am calling the Governor. 1 (213)……. 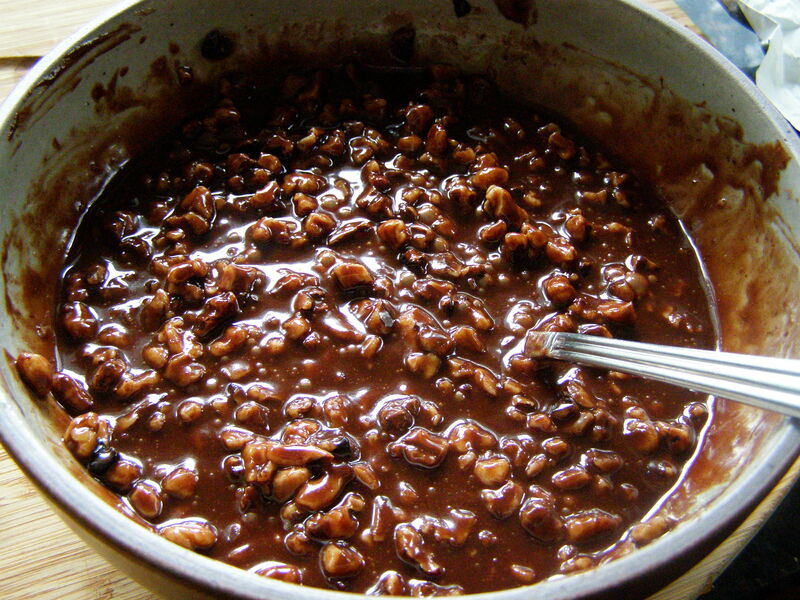 This entry was posted in Baking and tagged cooking, food, noix de grenoble, recipe, recipes, square, walnut square, walnuts. Bookmark the permalink. This year we holidayed in France, passing not all that far from Grenoble on our way to Briancon at the other end of the valley (and eventually to beautiful Lake Annecy). At Briancon we ate and enjoyed the famous Fig & Walnut Tart (Tarte Vauban), so I know that Walnuts are a local-ish speciality! I would love to find the Fig & Walnut/Tarte Vauban recipe but have searched the internet without success. I wonder if you know the secret?! Good idea HopeEternal , there is a fresh fig, walnut, and cream tart, is that it? The Gateau Vauban we ate was a slice of almost solid chopped figs and walnuts on a pastry base, but with no cream. The site says this about the ingredients: “c’est un gâteau sans farine à base de figues sèches, de noix, d’amandes, de sucre et de blanc d’oeuf”. The recipe is probably a closely guarded secret but not difficult to work out from the ingredients listed, I suppose. We thought it was extremely good value at 1euro for a good sized slice! The Famous Grenoble Walnut! I came across your post in a totally random way and it brings back so many memories of my exchange visit (from Scotland) to Grenoble when I was 16 years old…what memories, and how many walnuts do you Grenoblians eat…and in astonishing ways. Wonderful sweet treats.